Today was the day! Today we were going to find out what was going on with that strange construction in the centre of the lava lake. I was awoken by Amie, who seemed alert and ready to go, and found COLUS and OROTHO also already up and walking around. I helped Amie wake up the others before we all sat around eating a hearty breakfast, something to keep us going through a day that was likely to be full of action and adventure! We weren't taking any risks at all; we were all equipped with our blowpipes, I had my pickaxe - which now seemed to serve as more of a weapon than a tool - and COLUS was using my bow. We couldn't guarantee that we were only going to encounter HoN Co. guards; there could be Creepers, the undead, pig-men, floating ghost creatures, or even the Elite. We had to be prepared for any eventuality. OROTHO was going to remain in the camp and wait for UOPETA in case he returns with news from SERVERE, whilst the rest of us would head into the building and find anything we can to fill in the blanks. "I want everyone to be on their highest guard! There can be no margin for error! If you see a guard or creature that poses a threat to you or any of the rest of us, you take it down with no hesitation! Main priority is gaining access to the construct, with any obstacles being disposed of non-lethally. Only if the non-lethal method is insufficient, then you use a more lethal means." Collecting all of our equipment, we set off through the gates out from the base camp. OROTHO was under orders to remain at the camp until either we returned, or SERVERE came through to the Nether with news from SERVERE. Otherwise he wasn't to move. He didn't seem too bothered by this as he had always struck me as the pacifist of the group. Likely he'd be documenting whatever he could from the confines of the base camp which he could later use back at the lab. We had all grown accustomed to the route we would have to take to get to the construct, and we made a beeline directly for the hill that lay on top of the correct path. Once there, we headed underneath the hill and through the elaborate tunnel system that wound through the strange Nether rock, that encased us. We reached the bottom of the set of stairs, COLUS leading in front with the bow and arrow ready. 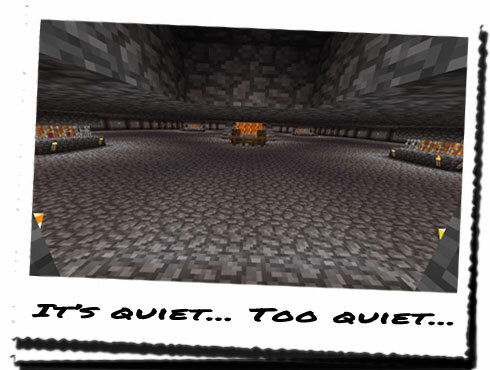 We had yet to encounter a single HoN Co. guard or creature at all, and I was beginning to wonder if the Nether had recently experienced a mass evacuation of all life! The construct before us looked totally abandoned from the outside, and I was beginning to now wonder if there were HoN Co. guards here, but they were all Elites... That would mean they're all capable of becoming completely invisible at the press of a button or something, in which case we could be severely outnumbered or outmanoeuvred. "Be on the lookout for any HoN Co. employees that could be inside. We cannot limit ourselves the what could be inside, so expect the Elite, as well as Creepers and guards." We began to make our way across the surprisingly thin gangway that merged off from the path and snaked its way towards the construction. Being much closer now, I could see a strange door set into the front, with glass windows that allowed us to see inside. But it seemed pretty empty there too. I had begun to wonder to what degree the lava flows actually spread out through the construction, as they seemed to enter through the top and leave through the bottom. That meant it would run through the centre at some point. Were they actually using the lava as a source of obsidian? Or was this just an aesthetic design choice...? It was hard to tell from this distance, but I couldn't make out any form of piping that could be used to channel water, so that could be a good thing. 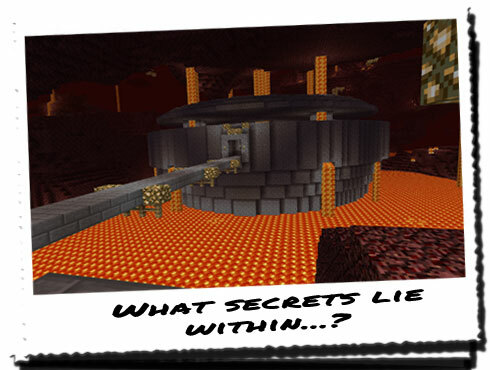 We reached the final straight and could now see into the construction itself; the large lava fall that seemed to enter through the centre was visible behind a desk, running precariously close to a wooden structure which seemed to look like a set of stairs. Even at this close distance, we couldn't see any guards, scientists, workers, anyone! It was incredibly strange that no-one was around at all! As we reached the doors, we made a quick check through the thick panes of glass before opening it; a series of pressure pads on the floor allowed the door to part in the middle, opening up a massive entrance that led through to an even larger room! "Okay, look around for anything that might help us find these Eyes of Ender. We have to assume this place was constructed by HoN Co. in a bid to find the same thing we're looking for. That means they're our competition. Use your blowpipes as required, and don't put yourself in an unnecessary danger!" We all spread out across the large expansive room and began to search for any signs of life. I made an instant beeline for the desk that now seemed to have a few shelves stacked around it. A good start I think.